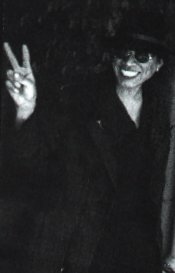 On 6th March 1998, when Sixto Rodriguez walks out on to the stage at the Bellville Velodrome for his first South African performance, a 25-year-old mystery will end and a new story will begin. This will be “the answer that, makes the questions disappear”. 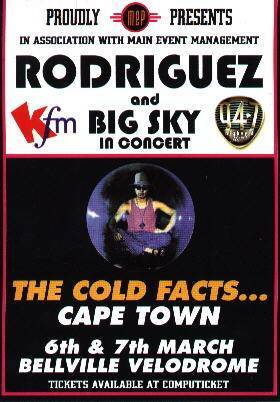 The mystery that will be solved is: what ever happened to Rodriguez, the artist who recorded the cult album ‘Cold Fact’ that has been so hugely popular in South Africa since 1971? There have been so many rumours and urban legends all these years. Stories that he was dead, blind and imprisoned have all proved to be false. The simple truth is that nothing happened to Rodriguez. South Africans didn’t know where he was and he barely knew where South Africa was. He knew of Australia and his fans there because he had successfully toured there in 1979 and again in 1981. Since then he had continued his full and varied existence in his hometown and birthplace, Detroit, Michigan. He had raised three daughters, Eva, Sandra and Regan, received a BA Philosophy degree from Wayne State University, travelled around America with a North America Indian tribe and stood as a candidate for public office on numerous occasions, including for the position of mayor of Detroit. His four recorded albums,’Coming From Reality (After The Fact)’,’Cold Fact’,’The Best Of Rodriguez’ and ‘Rodriguez Alive’, continued to sell consistently and were eventually released on CD, with the exception of the ‘Alive’ album. This was a recording made on his 1979 Australian tour which received a one-year-only limited vinyl release in Australia and is therefore very scarce and collectable. Besides his continuing success in South Africa and Australasia, however, Rodriguez is virtually unknown in the USA, England and Europe. It was the ex-South Africans who left their homeland in the ’70s and ’80s who spread the word about these albums in these areas. If’is hoped that even though Rodriguez is now well into his 50s, the success of this South African tour will kick-start his belated but deserved career in the USA and Europe. Tours to Australasia and Canada are being considered, as is the possibility of some new recorded material as well as a live CD from the South African Tour. 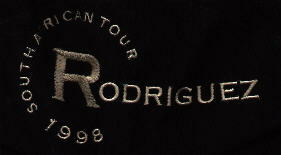 The revival in Rodriguez’s career happened as a result of the South African release on CD of his debut album ‘Coming From Reality (After The Fact)’. The liner notes that accompanied this CD raised the question of what had happened to Rodriguez and whether there were any “musicologist detectives” out there who felt motivated enough to find out. Well, there was one in Johannesburg and Craig Bartholomew immediately began his one-year search that resulted in him locating and speaking to Rodriguez in August 1997. At the same time, contact was made with Rodriguez’s daughter Eva through an Internet website that had been established to try and find the missing artist. 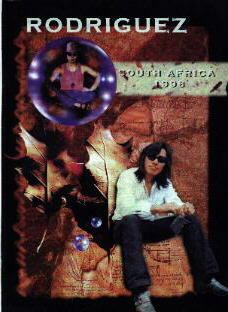 Soon Rodriguez became very aware of South Africa and the large cult following that he enjoyed there as well as the thousands of his CDs that were still being sold there year after year. At this stage Rodriguez himself did not have copies of his own albums; all he had was a copy of ‘Cold Fact’ on a reel-to-reel tape! News of his discovery and impending tour was received with a sense of amazement and disbelief by his many fans in South Africa. Nothing short of the news of a joint tour by Elvis Presley and Jim Morrison could have aroused such a reaction. Well, Rodriguez is very much alive and living in Detroit and now, 27 years after his music first appeared in South Africa, he is performing in this country. We South Africans have been privileged to witness many awe-inspiring and wondrous political, musical and sporting events during the past few years. We have witnessed concerts by some of the biggest names in contemporary music. However, this tour must surely rate as one of the most unexpected and eagerly-anticipated musical events ever in our history. It is with great pleasure we South Africans welcome Sixto Rodriguez to our country. I was in Traverse City for the film. You were great I missed the show last night in Chicago. When will you be back to Chi and when will you be in Detroit? ?